"This was a great weekend," said Kyle Hughes, coach and mentor. "The team has been working on improvements to our mechanical gripper and hatch mechanism, so we worked diligently all weekend testing, debugging, improving." "Total Quality, this team understands. Attention to detail is a core demand. From robot through team members right down to the floor. This team exudes refinement and so much more. Congratulations, Team number 27, Team RUSH," judges said. "To finish ninth in seeding and to win the Quality Award with all our improvements was a true honor," Hughes said. "The Quality Award isn't just about the robot, it is about being a role model team to others and our kids really demonstrated that this past weekend. The students picked up any slack we have had and ran with it. From helping teams in their pits to getting teams excited in the stands, our team really took this tournament by storm. An example of gracious professionalism from the students was the fact that Kyle Brooks, a senior on the programming team, spent all of Thursday and half of Friday programming a team's robot after they had a terrible time with their code. This team not only was able to compete, but did very well once on the field – that's what I'm talking about." "We have also earned 13 quality awards, which is now one more than any other team in FIRST. 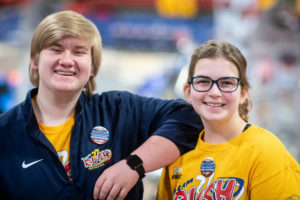 Team 254, CheesyPoofs out of California had 12 with us until this weekend," Hughes said, adding statistics were collected by RUSH alumus Austin Schmitz. Grace Havel and Logan Rajala were nominated by the mentors for the Dean's list. "We couldn't be more proud of them," Hughes said. "Their interviews went well and both students have grown so significantly through the process." "Everyone was so excited to see Wolfie made it there," Hughes said. "We had a blast with Wolfie in the pits, in the stands and on the field. Thank you, Clarkston, for supporting us." The Michigan State Championship is next week, April 10- 13, at Saginaw Valley State University. The competition schedule can be found on Facebook and Twitter @TeamRUSH27 or check www.theBlueAlliance.com for match schedules, streaming and results.